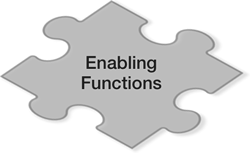 These are the central, enabling functions provided by the XSEDE system. They provide the framework for satisfying most--if not all--of XSEDE's user-facing use cases. The user-facing use cases (all use cases not in this category) describe what people expect to do with the XSEDE system. (Each user-facing use case emphasizes the issues of particular importance to a specific research purpose.) These "canonical" use cases describe the basic functions that the system must provide in order to satisfy all of those expectations.